Well, it took a significant amount of time, an appalling amount of money, and plenty of plain old-fashioned being in the right place at the right time, but I've finally assembled a full, physical Minion Arda deck based on Goblin King's decklist. Every card is legitimate, black-bordered MECCG (no proxies, no Wizards Unlimited, no Challenge Deck reprints), and every one in the list, including rare Balrog cards, MEAS R1s, and MELE chase rares are present and accounted for. The deck container is a black Dex Protection Supreme Game Chest with the removable compartments taken out for more space. All told, the box holds 1082 double-sleeved cards (1050-card deck plus 32 havens). 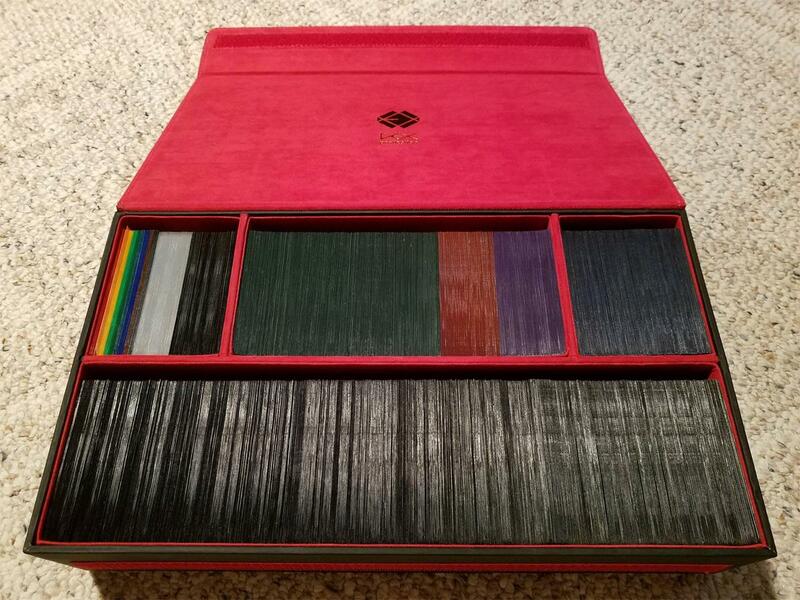 Play deck is black, characters are dark blue (top right), minor items are purple, tested rings are red, MP sources are green, havens are clear, and the rainbow is a set of Ringwraiths and modes for all nine Avatars. Not pictured is a full set of minion locations, sleeved in grey, which wouldn't fit in the case and consequently have their own deck box (Ultimate Guard 80+ Deck Case, Land Edition (Swamp)). The inner sleeves are KMC Perfect Fits, and the outer sleeves are either Dragon Shield Mattes (the Ringwraith Rainbow) or KMC Hyper-Mats (everything else). That is a thing of beauty! Mine looks nowhere near as nice. I hope you are able to get it on a table locally. Or fly out to Sacramento California for ConQuest (March) or ConQuest Avalon (November) and we will play with you. Pro tip on flying with a game cube: ALWAYS take it as your one carry on item. That way, you can be there when they inspect it and you can make sure they don't loose any cards. Too many people have checked game cubes into luggage only to find its been rifled and cards are now missing. Wow! What a nice setup. That box is amazing too. I haven't heard of Dex Protection before but that's the nicest card box I've seen. Thanks for sharing! I think this is my final write up on the rules we use. Overall Goals: This version of MECCG has two goals. Even though they have to be listed in a sequence; they are of equal importance. Think of them as two goals sitting on either side of a balanced scale. DARK ARDA must teach most of the rules of a regular Middle Earth Lidless Eye game. For this reason we avoid a lot of exception rules and we do not make special text for the cards just for this game. We try to use the rules and existing errata on cards as much as we can. DARK ARDA must be fun and in the spirit of Tolkien’s work. This game would be diminished greatly if some cards were not included in the game. To illustrate how I’ve tried to achieve balance between these two goals, I’m going to discuss the three Ringwraith modes cards that allow them to travel around the map (Heralded Lord, Black Rider and Fell Rider). If I was strictly following the rules, three copies of each of those mode cards would be shuffled into the huge deck. That would mean most players would never have access to them or the ability to shift their Ringwraith into one of those modes. That doesn’t sound like much fun or in keeping with the spirit of this fine game. So instead, I opted to give each Ringwraith a copy of each of the mode cards. They are able to assume one of these modes during the organization phase if located at a Darkhaven. If they want to switch into another mode, they must first travel back to a Darkhaven to do so. DARK ARDA is a game cube MECCG game for 2 to 9 players! 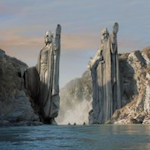 Each player assumes the role of one of the nine rulers of mortal men who were corrupted by a ring gift from Sauron and are now his undead servants. This version of the game consists of several decks: a 117-card Random Character Deck containing Minions and Minion Agent cards; a 176-card Marshalling Point Deck containing cards that give you marshaling (victory) points in this game; a 50-card Ring Deck that represent all the various kinds of magic rings that can be tested for in Middle Earth Lidless Eye; a 55-card Minor Item Deck; and finally a massive 607-card Play Deck, which includes 240 Minion Resource cards, 200 Hazard Event cards and 167 Hazard Creature cards. A Minion Location Deck (without any Underdeep locations) is also used when playing DARK ARDA. Resource Cards: The majority of the minion resources come from Middle Earth: Lidless Eye with most of that card set being thrown in. One notable series of cards from that set that are not usually included in the game are the Ringwraiths’ Unleashed cards. Some of the Unleashed cards are powerful while others are useless in this environment. That and the odds of seeing a card you need being small, led to the decision not to include them. A few abilities from the Unleashed cards can be allowed in the game for larger player counts which will be explained later. Hazards: The hazard creature cards come from all sets including ME: The Wizards and ME: The Dragons. The hazard strategies included in the Main Player Deck include: unique dragon cards, drakes, men, elves, dwarves, Maiar, spiders and spawn. Most of the hazard event cards come from ME: Lidless Eye or later. There is very little roadblock used in this game as it tends to slow down the action. But a few cards are left in for thematic reasons. All players roll dice to determine who is first to select the Ringwraith he or she is playing. Players should sit at the table in order of lowest roll to highest roll going clockwise. Once all the players are seated the person that rolled the highest will select his Ringwraith first. Proceed counterclockwise so that the person who rolled lowest selects last. Once each player has had an opportunity to select their Ringwraith, the Ringwraiths with printed abilities to have Ringwraith followers get to make their selection. The Witch King makes his pick first, followed by Khamul and then back to the Witch King, if there are still selections available. If Uvatha is still available, any other player may claim him as a Ringwraith follower. Any remaining Ringwraiths are set aside in the event they can be played later in the game as followers. First, sort the Character Draft deck into three piles: the first containing Minion or Minion Agents with 7 Mind or greater; the second containing Minion or Minion Agents with 6 Mind; and the last pile containing all the remaining cards. Each player is dealt one card from the first pile (there are a total of 9 in the game). If there are four or fewer players, each player can be given two of these characters instead. Each player is given two cards from the 6 Mind pile (three if 4 or fewer players). The remaining cards from the first two piles are then shuffled into the last pile. Nine cards are then given to each player from the deck. Once the draft pool is distributed, the player that selected his or her Ringwraith avatar last is designated the first player. That person will get first choice at selecting cards from the Minor Item deck and will be moving first. If you are playing with a group of 5 to 7 players, two players will be going first simultaneously. If there are 8 to 9 players, thee player simultaneously move first. This is explained in the original ARDA rules. Once the first player has been determined, he or she is given first chance to pick all of starting party (or parties) minor items or permanent cards that can be played instead of minor items for Minor Item Deck. Selections continues in clockwise seating order until all players have made picks from what is available. All unselected minor items and permanent cards are now shuffled into the Minor Item deck. The top four cards in the Minor Item deck are revealed. All starting parties are to be checked before the game begins to make sure they are legal. Players who make a mistake in drafting must adjust their starting companies using their draft pool cards. Some Lidless Eye rules restricting racial traits in starting companies are in effect. In other words, unless at a Darkhaven, trolls and orcs cannot be in the same company as an elf, dwarf or Dunadan character. However, the Lidless Eye restriction on starting with Minion Agents are NOT used in Dark Arda. In other words, Minion Agents at the start of the game are played just as if they are Minions and they do not have to start at their home site or using a special card for the starting company. This is a change in the rules because it was found in playtesting that the Minion Agents rules were seriously decreasing the fun by limiting the playability of a large number of characters in the character pool. Other restrictions on company composition in the Lidless Eye rules are in effect. This means an Orc and a Troll character with the Leader trait cannot be together in a company without using Orders From Lugburtz on the orc. Step 4: Create Roving Character Deck. Once all starting parties have been verified as valid, all undrafted character cards are shuffled together and placed in a Roving Character deck. The top four cards of the Roving Character deck are revealed. DARK ARDA is played with each player controlling two hands, each made up with different types of cards. The first hand is 8 cards from the Play Deck and it is called your Player Hand. If you are playing a Ringwraith who selected Ringwraith followers in Step 1, draw one less card in your Player Hand for each Ringwraith follower you selected. The other hand is made up of 5 cards from the Marshalling Point Deck. It is called your Treasure Hand. If you selected Whispers of Rings instead of a minor item in Step 4, you can draw from the Ring Deck instead of the Marshalling Point Deck to create your opening Treasure Hand. Everyone is now ready to begin playing! Certain Ringwraith abilities and some resource cards allow Ringwraith cards not being used by players to be used as followers. In all cases, the Witch King gets to make his selection first. Once he and Khamul have made all of their selections, Uvatha can be selected by another player as a Ringwraith follower as stated on the card. Additional Ringwraiths can become followers to players who play the resources necessary to recruit them. Ringwraith followers are not allowed in a starting company. One can be brought in on the first turn using the standard rules for adding characters to a party. Until Ringwraith followers are brought into play, they sit in the Player Hand taking up space that would otherwise be occupied by resource or hazard cards. At the beginning of the game, a copy of the Minion Resource card Prone To Violence (ME: The Balrog) is considered to be in play. This means that any company that does not contain a Ringwraith may attack other companies that don’t contain a Ringwraith! When someone draws an actual copy of the Prone To Violence, that person may immediately play the card, even if it is not their turn, and draw a new card to replace it. If someone removes Prone To Violence from play using a player card effect, attacking others is no longer an option until a new copy can be played from the Play Deck. You cannot play cards targeting and removing a Prone To Violence until someone actually places the card into play. It should be mentioned here that unless a Ringwraith is traveling between two Darkhavens or is returning to the Darkhaven printed on a site card (IE Starter movement), the Ringwraith must be in one of three modes in order to travel. Fell Rider mode is overt. Heralded Lord and Fell Rider are both covert. Minion Agent cards are played as if they were Minion cards or characters in DARK ARDA. They can be part of any starting company without the use of a special card. They can be brought into play at Darkhavens. These are all exceptions to printed Lidless Eye rules and they are done to increase the character card pool and to make Agent cards more fun to play. Agent Minion cards can never played as hazard agents. In DARK ARDA, rings are very important things. They should also be very fun things to chase after. For these reasons we are playing with the minion resource card Whispers of Rings in the Minor Item Deck and we are also creating The Ring Deck. Whispers of Rings is a permanent event available instead of minor item at the beginning of the game that allows the player who chooses it to play up to two ring items underneath it. At the set up of the game, players who select Whispers instead of a minor item, may, draw 2 cards from the Rings Deck and 3 cards from the Marshaling Points Deck, instead of their normal 5 cards to form their Treasure Hand. Both of those drawn ring cards may immediately be played under the Whisper card on the first turn. However, this player does not refill his Marshalling Points hand as normal until the end of his or her first turn as an active player. During the normal course of play, players will acquire rings from the Marshalling Points Deck that they will wish to test. Once a player tests a ring, that player makes a roll then turns over the top 4 cards of the Ring Deck. He or she may exchange the tested ring for any one of the revealed cards that matches the roll. If the testing player also has a Whisper of Rings card in play, he can check those saved rings for a match as well. If there are no matches, the tested ring is discarded. After resolving a ring test the cards from the Ring Deck which were not selected are discarded. If the Ring Deck runs out of cards, all of the discarded cards are immediately reshuffled to create a new Ring Deck. The unselected cards under a Whispers of Rings card are not discarded. They remain there unless brought into play. They can be replaced by new ring cards after one is brought into play. Do you mind if I put those rules together in a formatted Word document? I plan on playing this format soon, but the plain text rules are a little hard for me to parse. Also, in the RIngwraith Mode Rules section, you say that Fell Rider mode is both overt and covert, and don't mention Black Rider mode. I assume that Black Rider is the covert one, and Fell Rider is overt? A version of these rules in a nice format is what this world needs! And good catch on the overt/covert typo! Hoping to get my set back on a table in a couple of weeks.